We have the privilege of working with many, talented local artisans. 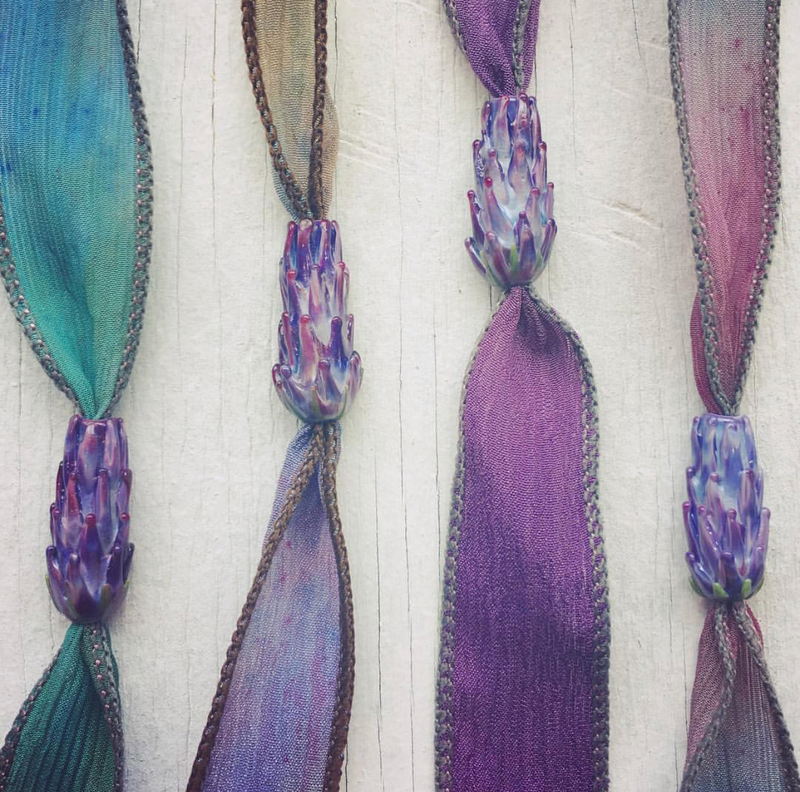 Andrea Kiernan has been handcrafting lavender bead jewelry inspired by our organic lavender fields for many years. 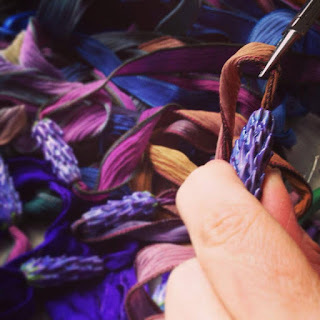 Andrea brings us into her studio to share the process of one of her latest additions to our lavender jewelry line - the Lavender Silk Wrap Bracelet. "I craft the focal lavender bead for each wrap bracelet from molten glass bud-by-bud into a lifelike sculpted lavender flower. Each piece is truly one-of-a-kind. Every intricate bead is handcrafted individually using colored glass rods and a torch fueled by oxygen and propane. I use various hand tools – tweezers, dental tools and graphite paddles to shape the beads. The bottom of each bead is melted flat and smooth in the torch flame so that it sits flat on the wrist. 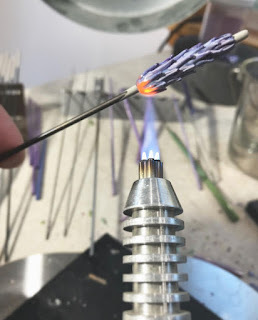 "After the lavender bead is sculpted, it is properly annealed by slowly cooling overnight in a digitally controlled kiln to ensure strength and durability. 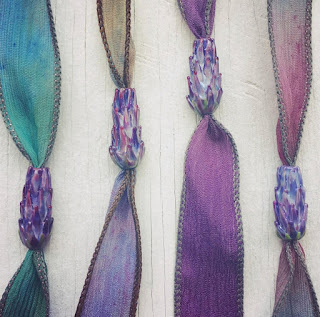 "The cooled glass beads are paired with silk ribbons created in collaboration between myself and a very talented California-based textile artist. 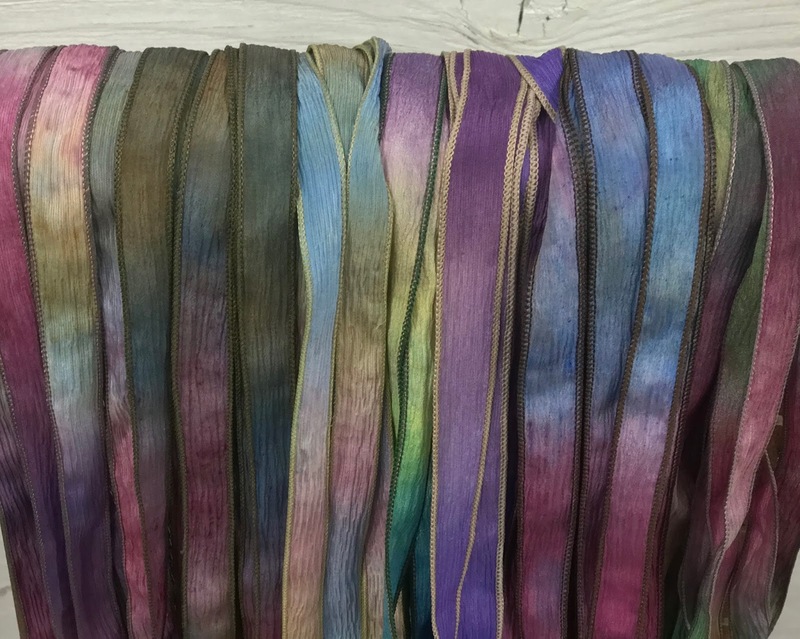 Each silk ribbon is hand painted with custom color blends creating subtle gradations of hue and tone using non-toxic dyes that are steam set to preserve vibrancy and resist fading. "The botanical details of the lavender bead are complemented by the textured leaf pattern of the button clasp closure that finishes the bracelet allowing it to be fully adjustable. Drawing from the idea that both the lavender and the 100% pure silk ribbon share innate natural beauty, the bracelets have a peaceful feel that makes them wearable every day. These bohemian style yoga wrap bracelets are versatile and I’ve seen customers also wear them as an anklet, or necklace. 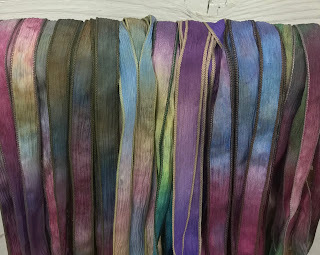 "Each unique silk ribbon is approximately 40 inches long and will wrap around your wrist several times. 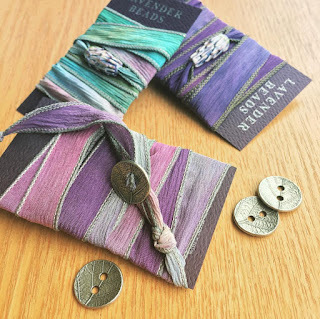 I wash the Lavender Wrap Bracelets by hand with Pelindaba’s Organic Lavender Hydrosol or a mild detergent and then lay the ribbon flat and allow it to air dry. The ribbons can also be carefully ironed using the silk or nylon setting. 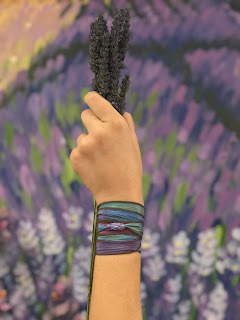 "I package each Lavender Wrap Bracelet in a sachet bag filled with fragrant, organic dried lavender buds. When not in use, simply return the silk wrap bracelet to the bag of dried lavender to infuse the silk ribbon with the sweet fragrance of Lavender Essential Oil. When next worn, the wearer of these silk wraps will experience a subtle aromatherapy treatment. "The miniature, sculpted flower heads are, for me, a way of preserving the fleeting excitement of the fields in full bloom so that they can be enjoyed as adornments year-round.